One of the most common criticisms of the cryptocurrency space is the idea of utility. The argument is that cryptocurrency has so little utility and, without utility, cannot possibly have value. Personally I think that idea is factually ridiculous, people use cryptocurrency every day, people use it to settle transactions, make investments, Bitcoin was even used to settle an international trade between countries recently. However, there are certainly cryptocurrencies that provide more utility than others. If you take even some large cap tokens, such as Stellar or XRP, they provide very little utility today, at least for the average person. Many (maybe even most) other coins provide little utility and are merely concepts at this moment. On the other hand, when there is a coin that does provide high utility, it is often reflected heavily in its price. Back in 2017, ICOs were the hottest thing in crypto. Due to its almost perfect suitability to the ICO process, and relative stability, Ethereum was the blockchain of choice for the large majority of ICOs. An ICO is an Initial Coin Offering. It is very similar to an IPO, however instead of issuing stock, the entity issues coins or tokens. However, an ICO is far more efficient and streamlined. As they’re conducted on a blockchain, there is no need for third parties to ensure trust, such as lawyers, banks or even the government. If an entity wants to raise funds, they can issue a prospectus or “whitepaper” to investors, call for funds, and release the tokens literally within hours. A good example of an early ICO was the Brave Attention Token, which raised $35 million in less than a minute. Because Ethereum was the most (or only?) reliable blockchain for smart contracts, it became the obvious choice for anyone wanting to run an ICO. This meant all funds needed to be sent in ETH, the Ethereum native token. As ICOs started to grow in volume, demand for ETH grew at a similar pace. Eventually, it seemed there was a new “huge ICO” every few days. Demand for ETH skyrocketed, which sent the price to new all-time-highs almost daily. The chart above shows a return of 168x over approximately 12 months. My opinion is this demand was not driven because Ethereum had the best technology in the game. In fact it had many flaws, one of which was illustrated by the DAO hack and resulting fork. Not only that, the Ethereum blockchain was plagued by bottlenecks, huge fees and slow transaction times as ICOs clammered for block space. You wouldn’t struggle to make an argument that many other blockchains were faster, cheaper and more secure than Ethereum. However, the difference was Ethereum was proven, and demand was driven by utility. As ICOs grew, people needed to use the Ethereum platform to send funds. Therefore they needed to purchase the Ethereum token, often thousands or tens of thousands of dollars worth. Demand skyrocketed, and Ethereum outperformed almost every other coin in the Top 50. The other big factor was its advantage as first mover. Once several entities had successfully ICOed on Ethereum, it became the platform of choice, simply because it became familiar to investors. There were other perfectly good platforms to run ICOs on, and some did (Mobius ran its ICO on Stellar, for example). But Ethereum had already cemented itself as the ICO platform of choice. More than 90% chose to launch their ICO and issue their tokens on Ethereum. As you know, we’ve been deep in a bear market for over a year now. However, glimmers of a new bull are showing. Bitcoin hashrate is up, Bitcoin transaction volumes are up, and most importantly, the market is showing bullish action (the crypto market has gone from a low of $101b in January to around $140b today). While bullish sentiment is still far from being cemented, we are seeing some clues on who might be the star performers of the next bull run. Tronix (TRX), eos.io (EOS) and Ontology (ONT) are all ones to keep an eye on. However, my personal pick for the next bull run darling is Binance Coin (BNB). Binance has already made a huge run. At the start of 2018, Binance ranked 31st in market cap, at $1.85 billion, just below Dentacoin and Dogecoin. As 2018 collapsed into a bear market, most coins got decimated. 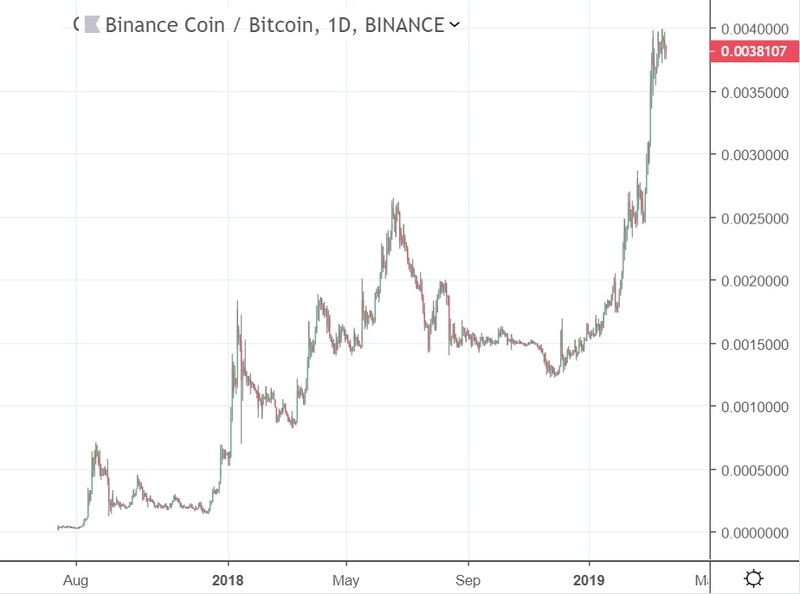 Binance held up reasonably well, and at the market low in December 2018 had climbed to #14, with a market cap of $836m, just below Monero and IOTA. Now in late March 2019, as the market has slowly recovered Binance has been see-sawing between #7 and #8 with a market cap of $2.1b, having leapfrogged even the likes of Cardano and Tron. Bear markets always filter out the crap, and also are common times for the cream to rise to the top. Solid coins such as Stellar, Litecoin and EOS have all emerged as coins that are here to stay, however none of those are big surprises. For most people, Binance climbing into the Top 10 is. But, more important than the rise itself are the reasons behind it. Binance is the Ethereum of exchanges. It’s the best exchange there is, perhaps not necessarily due to usability or tech (you could argue there are exchanges with a better UX or UI) but because it’s the exchange everyone uses. 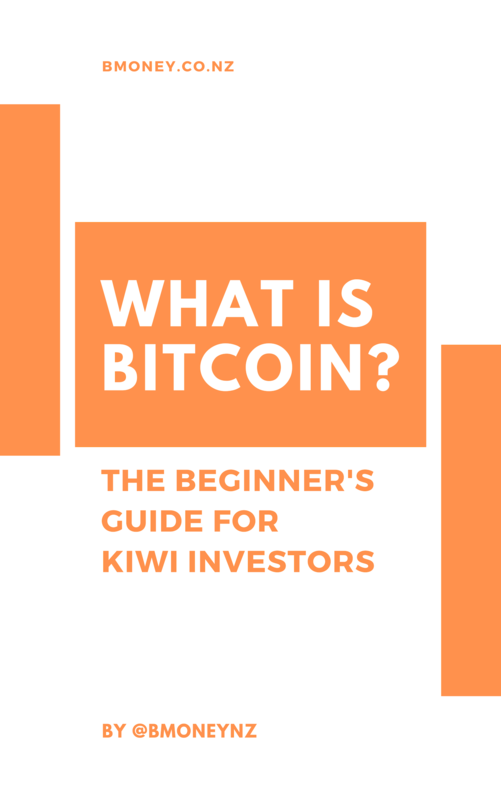 This means it has the highest liquidity and volume – vital to any trader or investor. It was the most stable and active exchange during the bull run of 2017, which brought in the lion’s share of crypto newcomers (which was a lot). Nowadays when a token wants to get listed, the holy grail is a Binance listing, hands down. It’s the NASDAQ of crypto, and it’s only getting better. When using Binance, trading fees are 0.1%. However, by using BNB to pay for fees, Binance gives you a 25% discount. This is one of the most beneficial utilities a crypto trader/investor could want – an instant 25% discount on their costs. If there’s one exchange that has leaped to the front of the pack during this downturn, it’s Binance. While many exchanges have stagnated or showed only minor improvements (Poloniex, Kraken, Bittrex? Even Coinbase?) Binance has done the opposite. It has stepped up developments and been even more active than it was during the bull. It has launched services in Uganda, Malta, Australia, made constant improvements to the platform (which you’ll notice if you use Binance daily) and in my opinion is in pole position to capitalise on the next bull run. The one key driver of this? Their CEO, Changpeng Zhao (or CZ, as he’s commonly known). One philosophy I take with all investing is to always invest in the people rather than the product. When it’s crunch time, it’s the quarterback who makes all the difference. If you’re putting money into something, make sure the quarterback is a superstar. If you follow CZ on Twitter, you’ll know the guy is a boss. Always working, always responding to suggestions, and well respected throughout the industry’s higher ups. He’s the quarterback you want! All the above will contribute to a Binance run, but IEOs are the key reason I see Binance heavily outperforming the market. If we look at how strong the demand for Ethereum grew as the ICO market took off, we know that investors are hungry for ICOs. They are fast, exciting, and give opportunities for very large returns. During the last ICO boom, returning 20-50x or even 100x on an ICO was not uncommon. But the ICO model in 2017 was hugely flawed. While investors could be assured of receiving tokens through the smart contract function, they had no control over how the funds were eventually used. 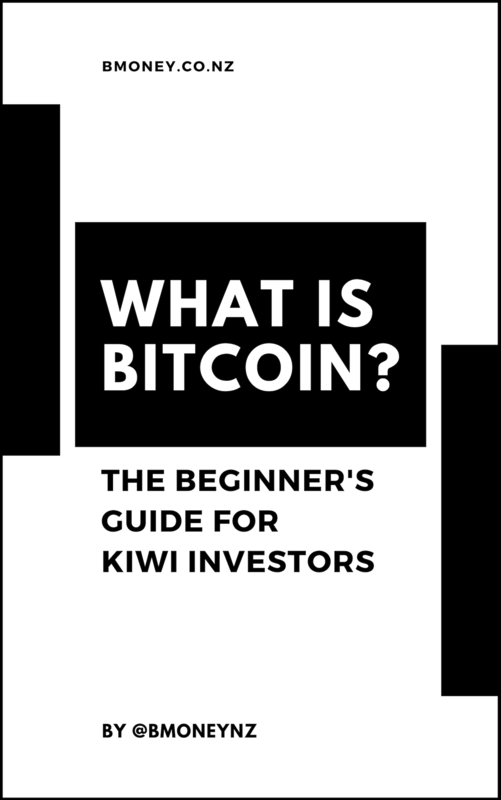 Because the industry had no oversight, nothing was stopping teams from simply disappearing after funds had been raised, leaving investors with nothing but a website and a whitepaper. In the early months of 2019, Binance has engineered a new model. We’ll call them IEOs (Initial Exchange Offerings). Binance IEOs are superior to ICOs for several reasons. Tokens are automatically listed on Binance once the raising is done. For many ICOs in 2017, getting listed on an exchange so the coin could be traded proved difficult – many coins never managed to get listed at all. Binance has strict listing requirements, so all projects are already vetted for legitimacy (to a degree). This highly reduces risk of scamming and misuse of funds. Binance has stated they do not list “shitcoins” under any circumstances. Listing on Binance has proved very difficult for many coins, even those that are legitimate projects. The criteria is strict. By launching via an exchange, it removes the gas and traffic problems that plagued ICOs during the last boom. Some people were paying thousands of dollars in Ethereum gas just to get their contributions in. 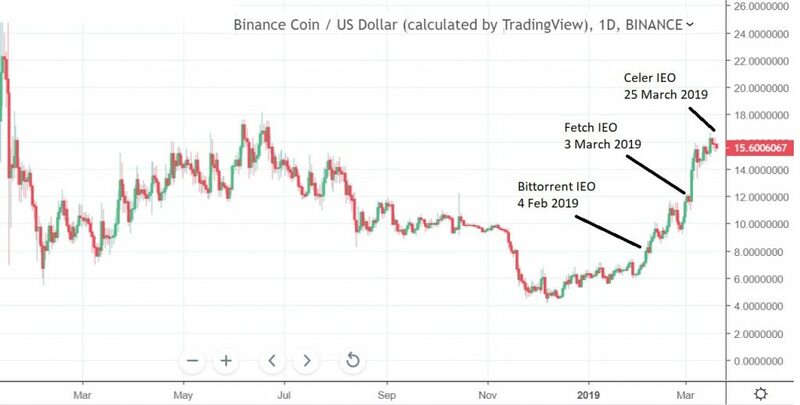 Since the beginning of the year, Binance has already run several IEOs through it’s Launchpad platform: Bittorrent, Fetch and Celer. All sold out within minutes and massive demand. The most recent, Celer, had 39,000 contributions sent in for 3,129 parcels. It was oversubscribed by more than 35,000 investors. One key factor in these IEOs was the currency required for investing. If investing through Launchpad, Binance required that all contributions were sent in Binance Coin (BNB). That might sound insignificant, but it’s huge. If all IEOs require investors to purchase BNB, and Binance receives the large majority of large IEOs, demand for BNB is going to skyrocket. The 168x we saw Ethereum do in late 2017 was due to exactly the same reason. But there are key differences this time. The coming IEO/ICO boom (if it eventuates) will be far larger than the previous one. We already saw various big companies attempt ICOs during the last bull run. It’s very possible in the coming bull run that won’t be an anomaly but an expectation. Additionally, BNB provides more utility than just IEOs; it’s also the token for the most popular crypto exchange in the world. That in itself will drive huge demand in the next bull run. Plus, we’re already seeing it rally on the few IEOs it’s already done. 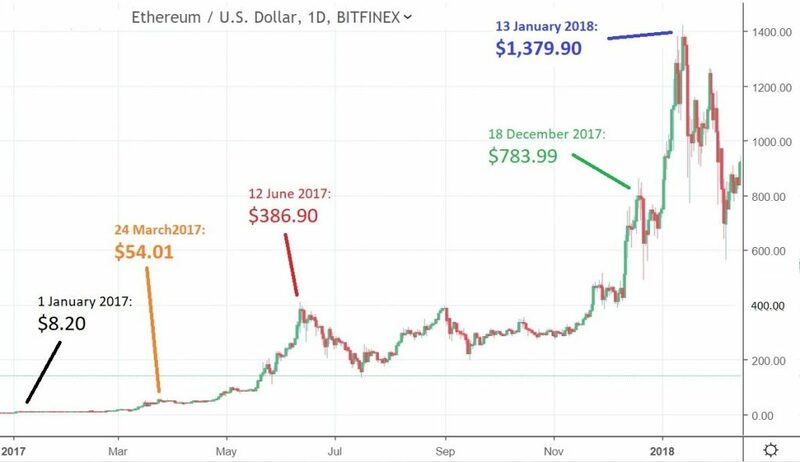 Ethereum showed similar beginnings in 2017 and went over 150x. What do you think? Is Binance going to the moon? All information in this article is for informational purposes only. This is not financial advice. Consult your own financial professionals for advice.